Mai's Ceremony :) She loves Phallaenopsis Orchids, and by mixing them with Hydrangeas and Roses these arrangements looked spectacular! Amrit's wedding reception in black and white, with white floral centerpieces alternating with vases with submerged orchids and candles. 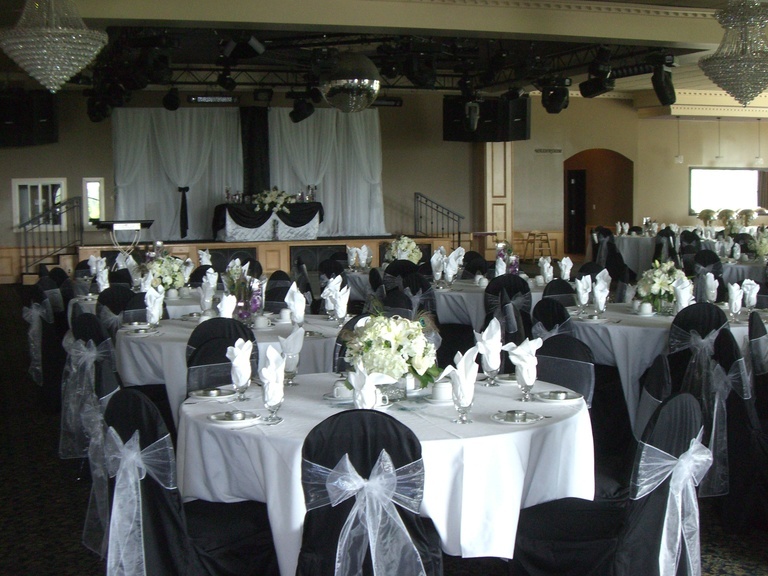 These are our black Scuba chair covers with white organza sashes. 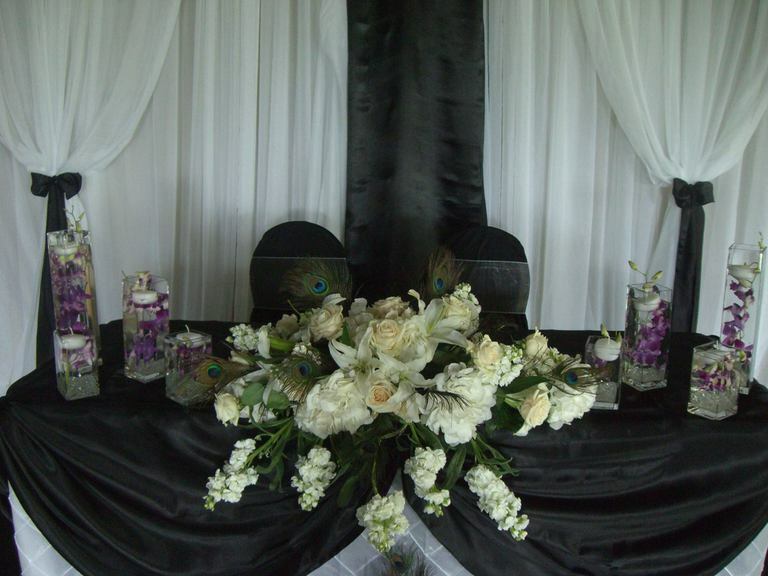 Amrit's sweetheart table in black and white, with peacock feather touches. We decorated her backdrop, her tablecloth, draping in black, designed her flowers and added the vases with submerged orchids and floating candles. We really loved the way this wedding looked. 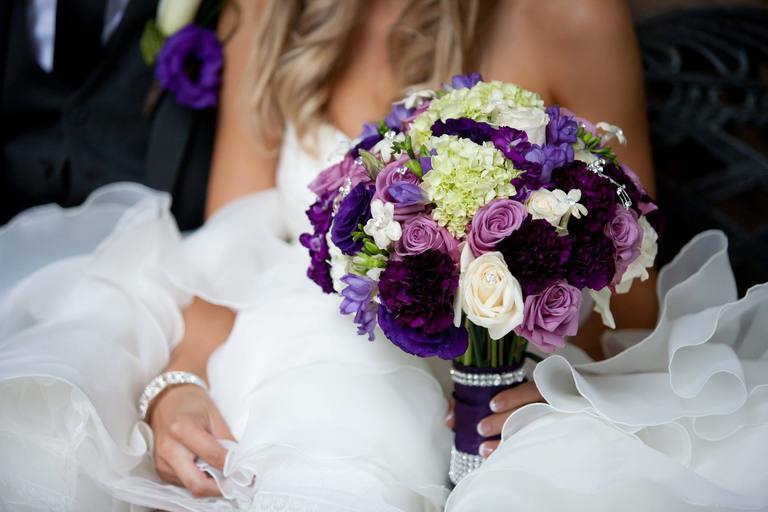 These bouquets were created for Tracey's wedding, at Swan E Set. She wanted to carry an all-ivory bouquet and have her bridesmaids carry an ivory, lavender and silver mix to match their silver dresses. We loved the result, I hope you like them too. Valerie's wedding reception. Such a lovely bride :) These are our spandex chair covers with satin sashes, crystal bowls with LED lights and a backdrop with chiffon panels and swags. A very inexpensive, and elegant set of decorations. Gayle's centerpieces with Kale, Hydrangea, Roses, mini Roses, Brunia and Dusty Miller. 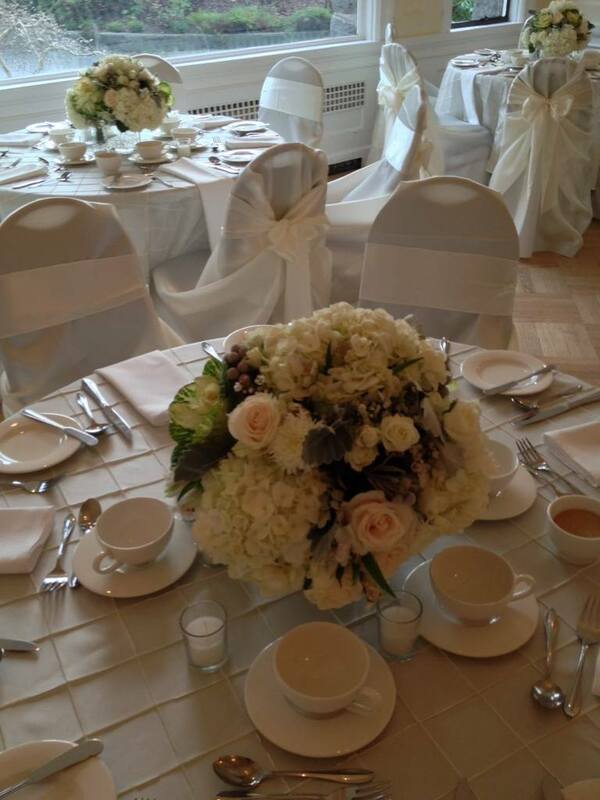 Our Universal chair covers with ivory sash and pintuck overlays. This is Gayle's reception. She rented our universal satin chair covers, our satin overlays and sashes, and we created these centerpieces for her, to complete the design. After the ceremony, we moved the main floral arrangements to the sides of the headtable. Gayle's wedding took place at Cecil Green, in UBC. These are the Ceremony pieces that we designed for her. They were moved to the sides of the headtable during the reception. Golden Eagle Golf Club is a hidden jewel in Pitt Meadows. This is Cerina's wedding and we decorated her chairs, tables and ceremony. 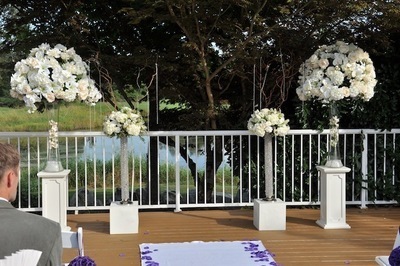 We also designed her bouquets and decorated her ceremony area. 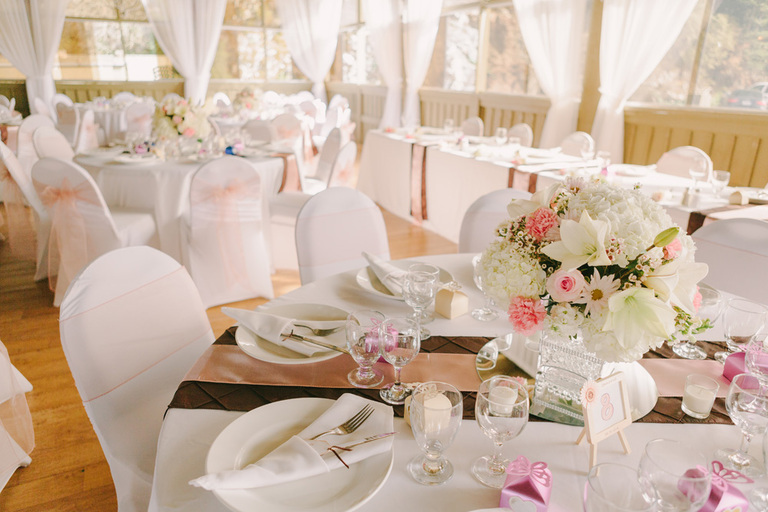 Her centerpieces were ivory with a touch of blush and pink. She also had chocolate runnes with a mauve sash on top. 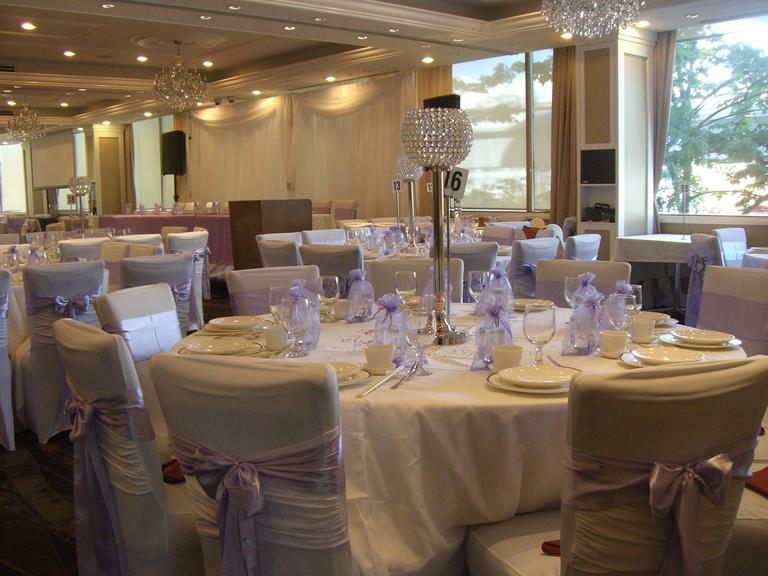 Spandex chair covers with organza mauve sash complete the look. Christina's wedding had such a delicate look with ivories and champagnes. A very classic, simple, yet elegant event. 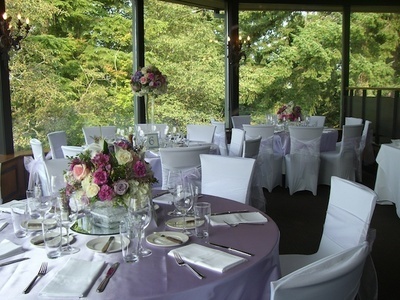 We loved working for her, and the venue was beautiful, with a view to the Fraser River and an Italian ambiance inside. 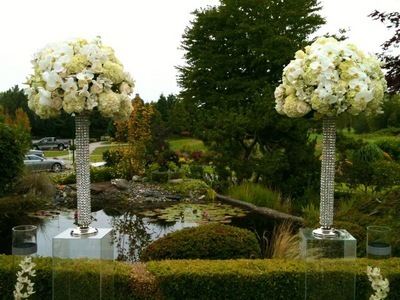 These centerpieces were designed at Meadow Gardens Golf Club. Kay wanted a design that was fresh, not classic, colourful and yummy! 2 of the vases had candies inside, and 2 had crystal beads and a floating candle. The flowers were designed in hot pinks and oranges. The Bride rented our pewter pintuck overlays and sashes and our spandex criss cross chair covers. These "trees" were designed with our flute glass vases, medium curly willow branches, hanging orchids, crystals and bubble votives with candles. 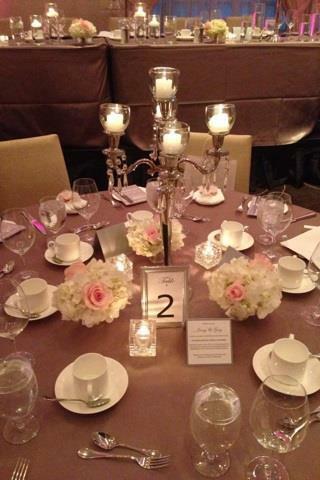 Each table had a mirror and 3 votives as well. 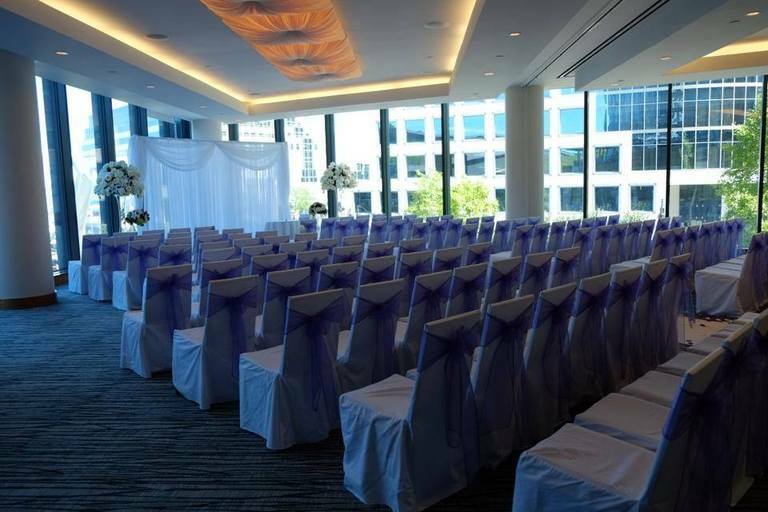 The venue is the Law Court House, were Lorraine had her Ceremony and her reception. Swan E set wedding decorations done for Dorsa. She rented our spandex covers with auburgine satin sashes and overlays. She also rented our flute vases and we designed a large floral topper with curly willow branches and hanging crystals for them. 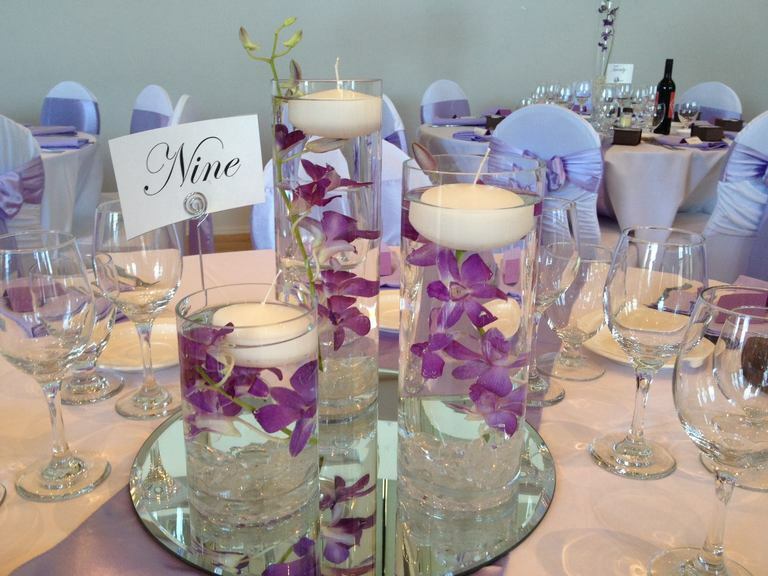 In half of the tables we had 4 square, tall glass vases with orchids inside. Everything was gorgeous! Dorsa, a mind blowing beautiful bride whose wedding gown was absolutely stunning, just like her. 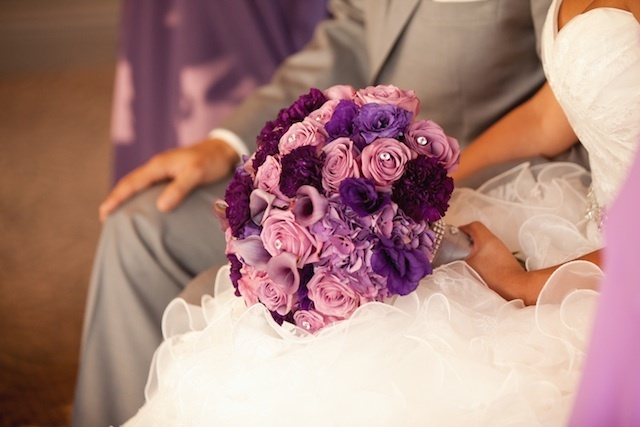 This is the bouquet we created for her. Her ceremony and reception both took place at Swan E Set. Her theme was all purple shades and silver. Fei, a gorgeous and vibrant Bride who wanted a colourful, unique, full and very exotic combination for her wedding reception. 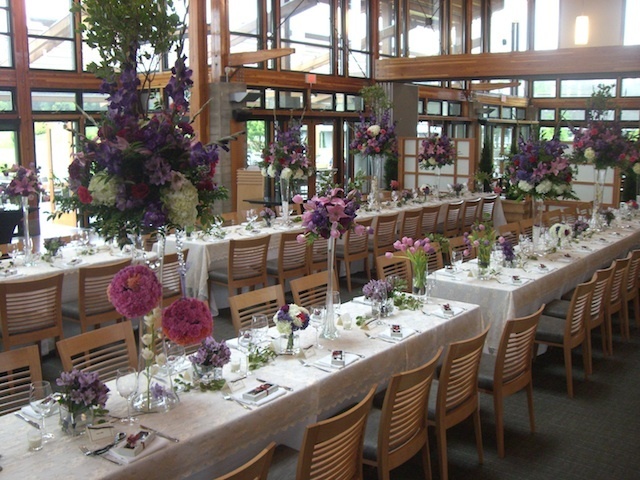 We had tall, medium and small arrangements along each table, and the colours were purple, hot pinks, oranges and greens. This is the close up of the Ceremony backdrop used for Sayako's wedding. 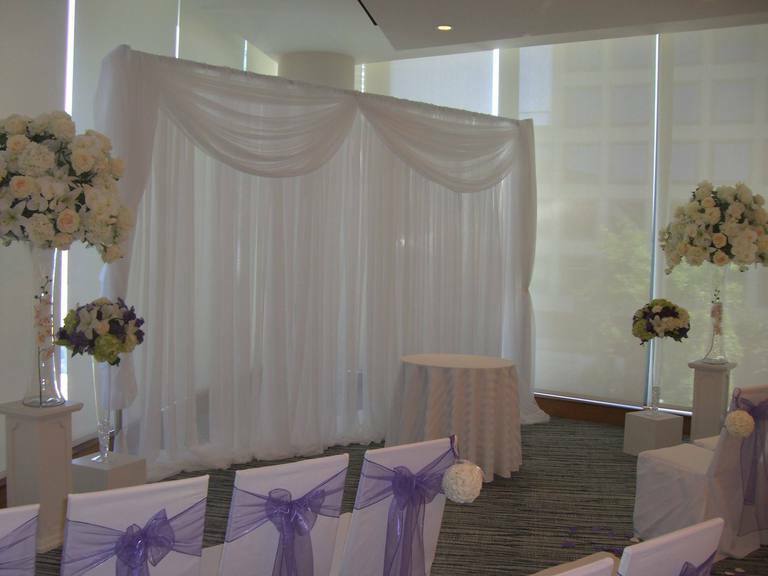 The silk arrangements we offer in rental, the centerpieces being re-used during the ceremony as well, and her chairs with organza sashes. The Fairmont Hotel Vancouver. Sayako held both her Ceremony and reception in the same room. 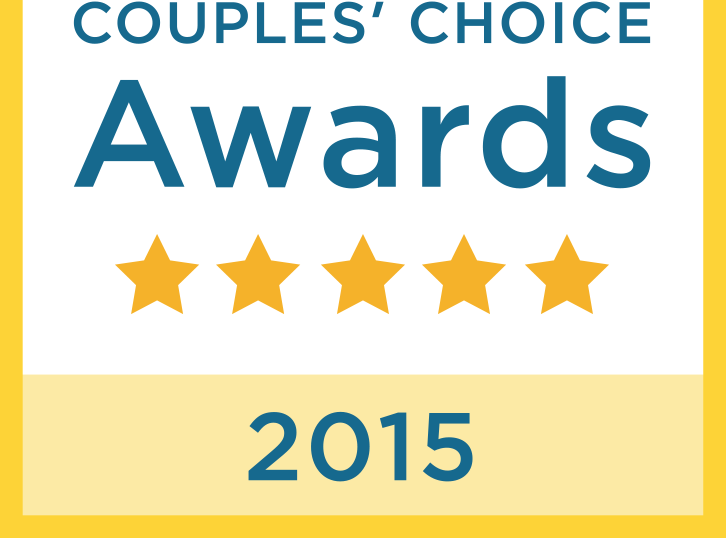 After the ceremony we had an express time re-decorating and turning the area into a gorgeous ballroom. The backdrop used for the ceremony was moved behind the DJ table, the large silk flowers she rented from us, were moved to the sides of the headtable. The lower arrangements are centerpieces which we re-used during the ceremony as well. All the chairs with covers and organza sashes were part of the reception too! whew! It was beautiful! Furry Creek! What a stunning, breathtaking place to get married at! 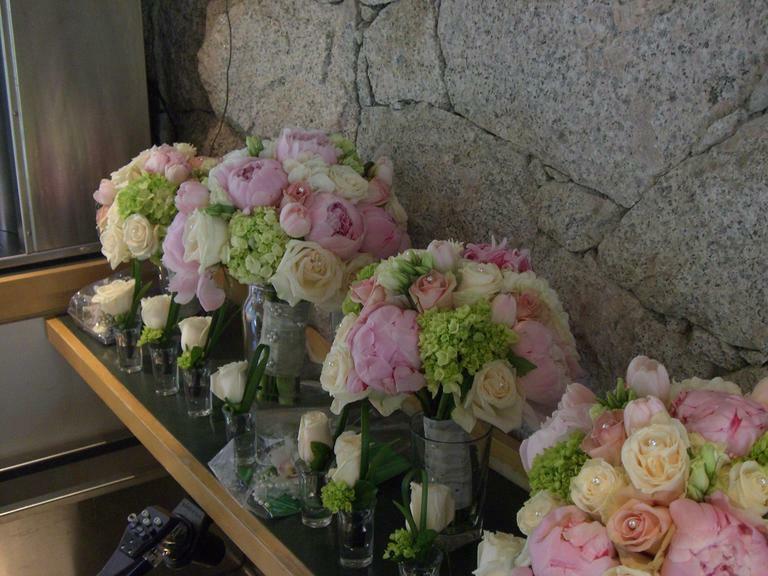 These bouquets were created with Peonies, Gaden Roses, Roses, and a touch of Hydrangeas. 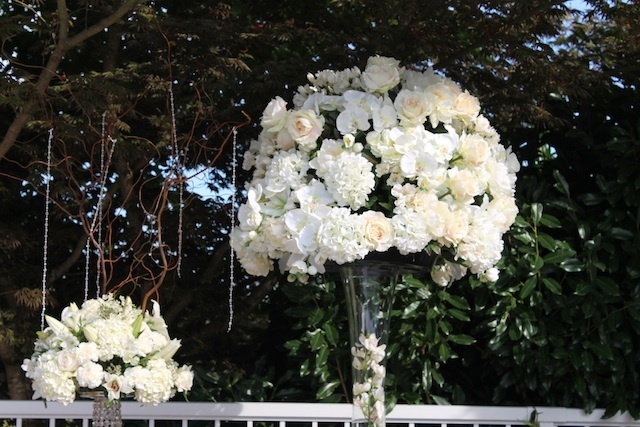 All of them were very large, the Bridal one almost 13" in diameter. 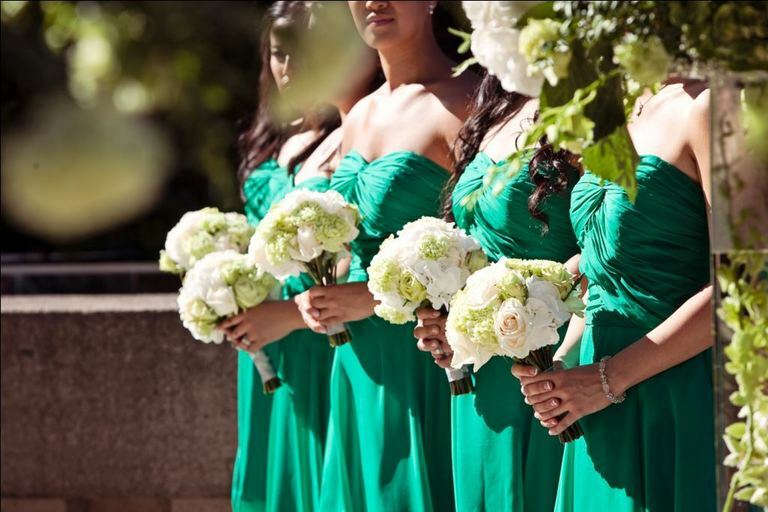 The boutonnieres were all ivory roses, with a touch of green hydrangeas and monkey grass. Sarah, the beautiful Bride, also had us decorate the columns with chiffon drapes, everything looked so pretty! Ivana had her reception and Ceremony at the Serbian Cultural Center, in Burnaby. 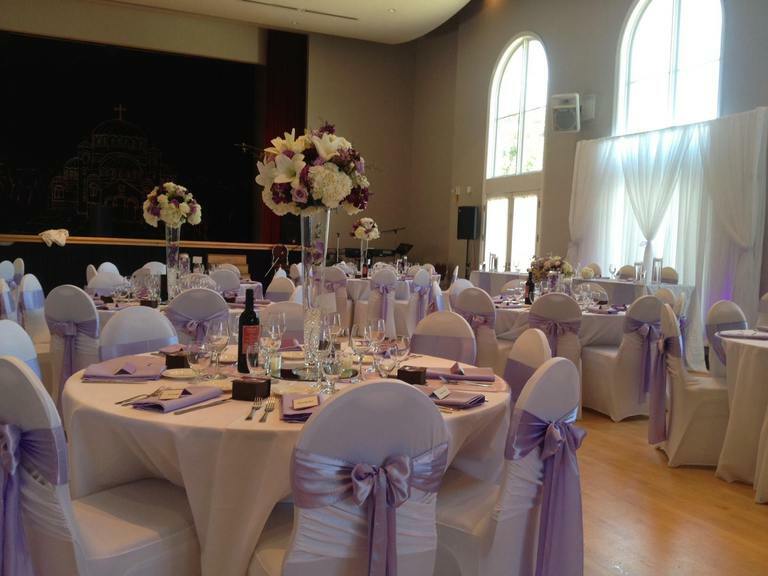 She chose our criss cross spandex chair covers with satin lavender sashes, satin lavender runners, and white tablecloths. We also decorated her centerpieces, which were 3 sets of glass vases with an orchid and floating candle, and alternating with the tall flute vases with floral toppers. Her headtable had a small backdrop behind, with purple uplights. It all looked beautiful, we hope you like it too. 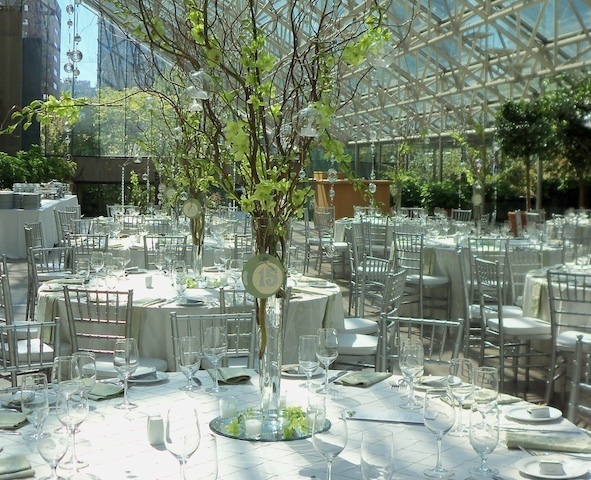 These wedding decorations were done at Seasons Restaurant, inside Queen Elizabeth Park. Gina rented our white spandex chair covers with organza lavender sashes, satin overlays in lavender and mirrors for the tables. 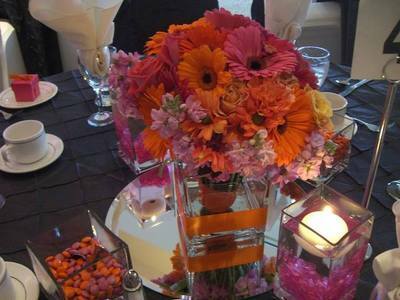 She also rented our 5x5 glass vases and alternated with our flute vases to have low and high centerpieces as shown below. 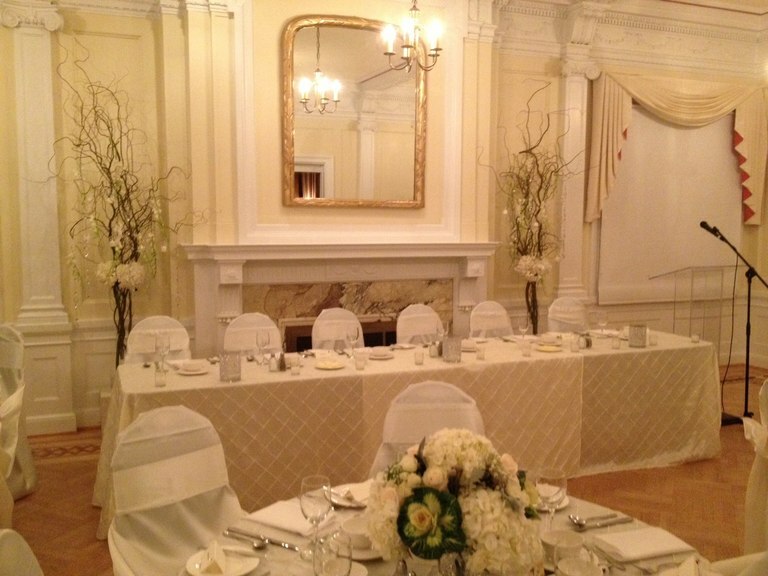 Lorraine chose the Law Courts house in Vancouver for both her ceremony and her reception. This photo below is in the outdoor area, with the "pool". It was such a lovely day and her bridesmaids (below) looked beautiful with her green dresses and these green and ivory floral bouquets. The Ceremony pieces were also green and ivory. And the bride looked absolutely stunning too! 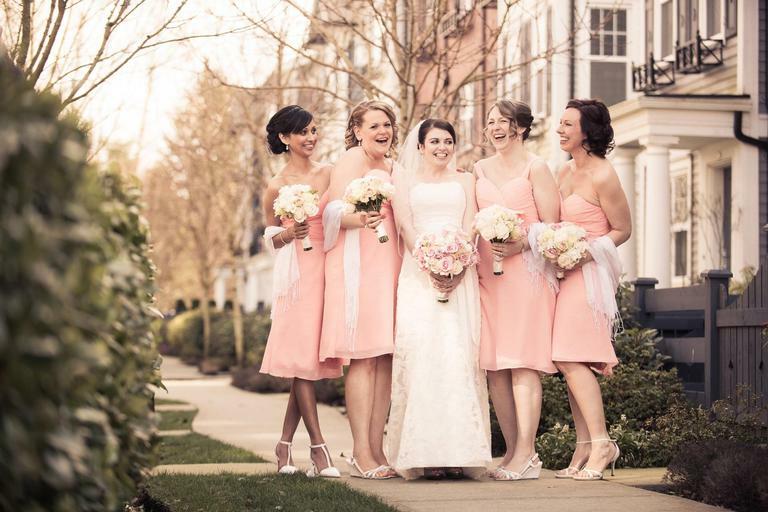 Lynn and her bridesmaids, such a beautiful wedding photo. Blush and ivory bouquets have always been a favorite. What else can compete with such sweetness? 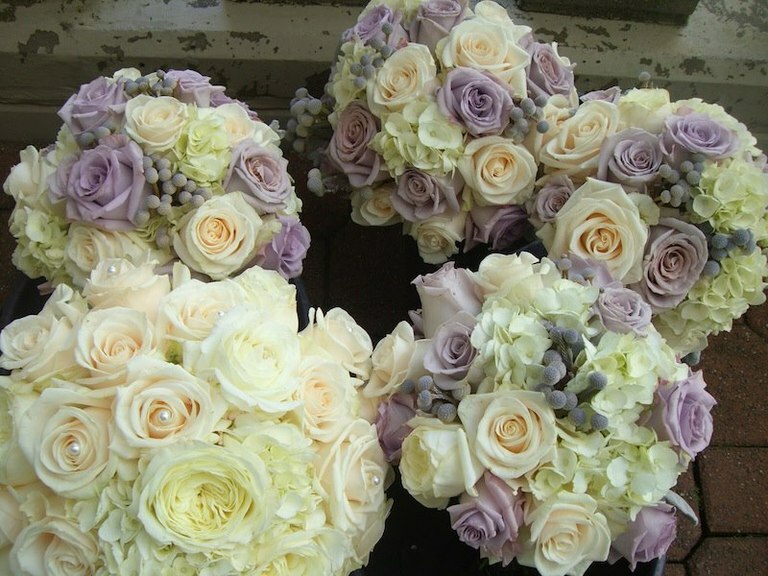 These bouquets were large for bridesmaids, at 8" each. They helped a lot decorating the head table after the Ceremony. 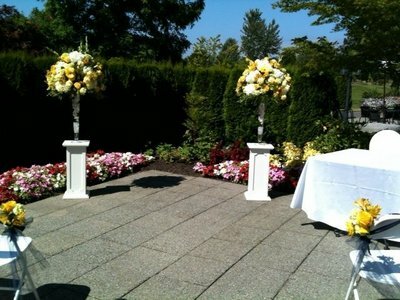 The wedding reception took place at Swan E Set and the ceremony at Coquitlam Alliance. Wedding decorations done at Meadow Gardens Golf Club, one of our very favorite venues. The bride's theme was yellow and ivory and we included pedestals, glass vases and floral toppers for the ceremony, floral decor for the pews, and centerpieces, chair covers, sashes and runners for the reception. 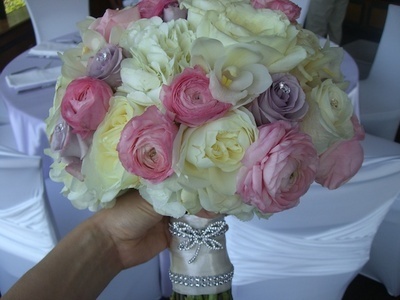 Nicole's bouquet was a hand-tied with bling touches. She carried Hydrangeas, Roses, Carnations, Stephanoties and Freesias. It had a wonderful fragrance! Groom's boutonniere with Calla and Lisianthus, Bridesmaids' and Bridal bouquets in ivory, lavender and purple, with a touch of green. 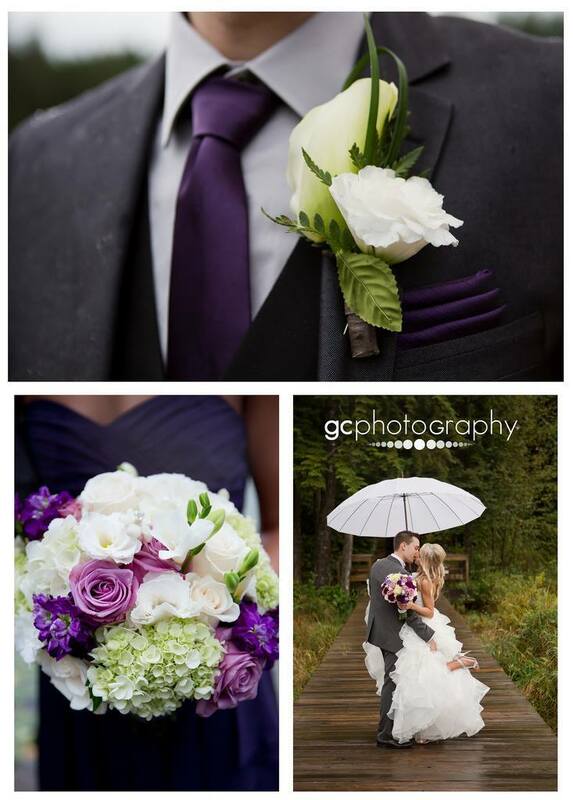 This wedding decor was done at Whonnock Lake. 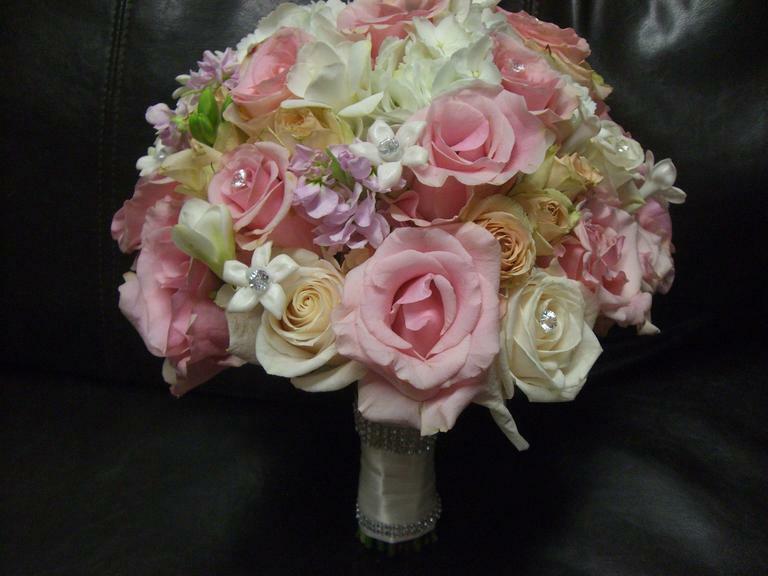 Beautiful floral bouquet in pinks, lavender and ivories, with bling touches. 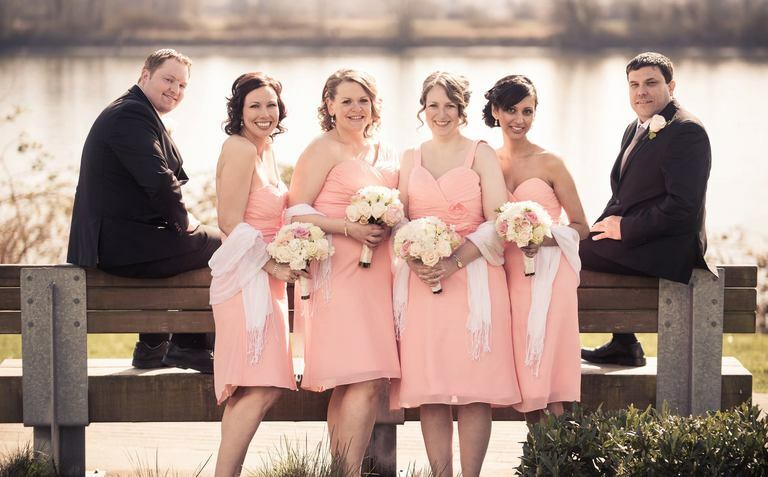 This Wedding took place at Seasons at Queen Elizabeth Park. 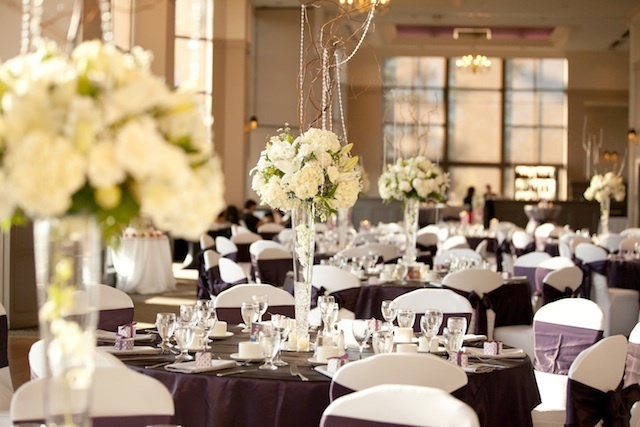 We also decorated the reception with chair covers, overlays, mirrors and centerpieces. Everything was beautiful! Budget Decor in rental: Sets of 3 glass vases with Orchids inside, floating candles and mirror are included. Our silk floral toppers include a pedestal, glass vase with or without orchids inside, and the highest quality of silk flowers. These arrangements can be moved from the Ceremony to the Reception. This is one of our silk floral toppers we carry in rental. The flowers on the left are fresh, and the large topper is silk. Both look very alike because the silk floral arrangement has been designed with the highest quality of flowers to help you save money in your ceremony decorations. 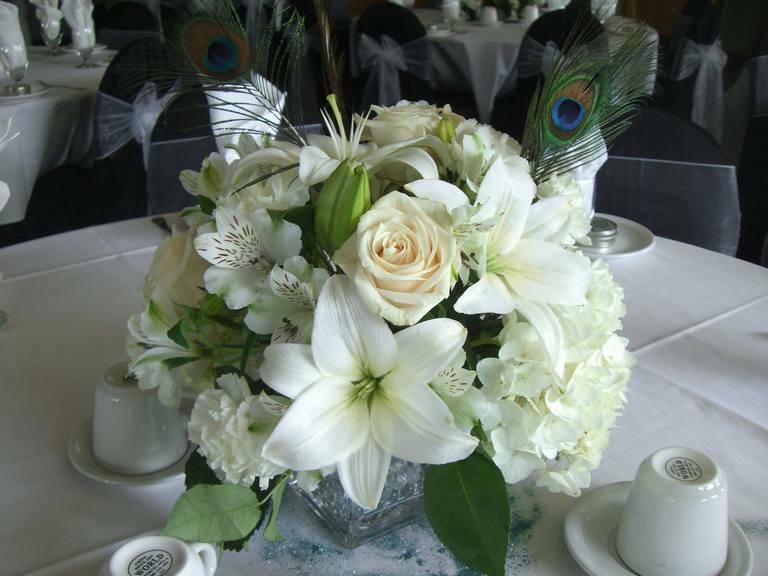 Floral decorations done in white with a touch of peacock feathers. This wedding took place at an Indian Hall in Surrey. 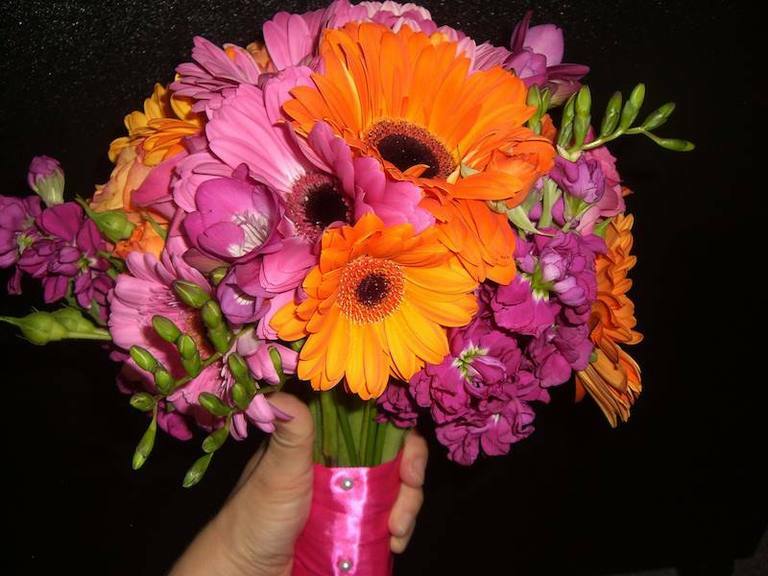 Bridesmaids bouquet in vibrant orange and hot pink. 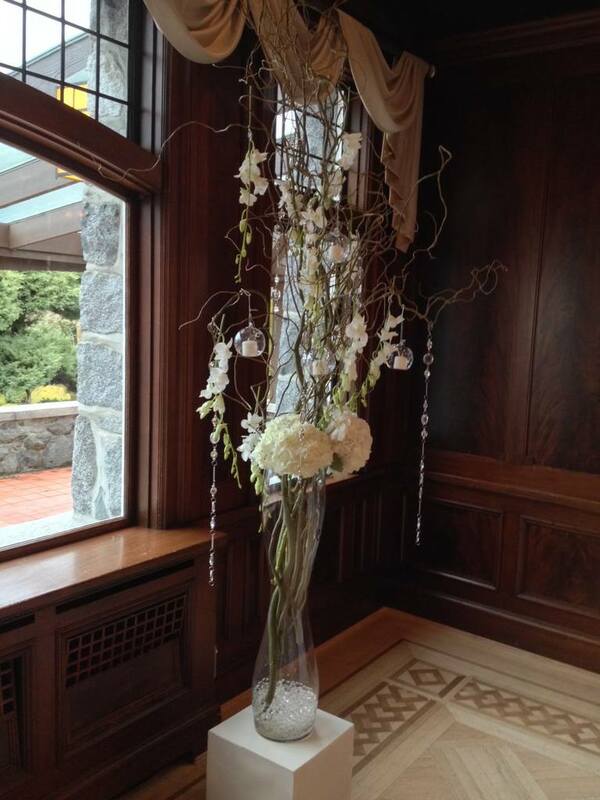 We had the honour of decorating this Bride's hall at Meadow Garden's Golf Club and her Church in Fort Langley. 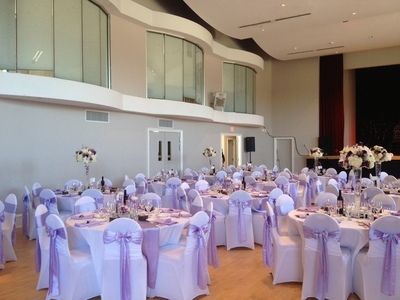 This wedding took place at the Serbian Cultural Center, in Burnaby. 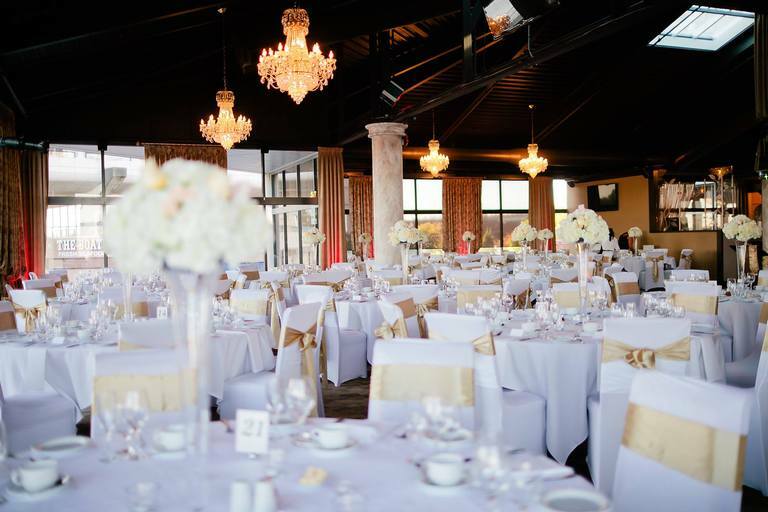 We decorated all the rentals shown in the photo (chair covers, sashes, napkins, tablecloths, runners, glass vases, mirrors, backdrops, candles, etc). The result was gorgeous!